I headed to Incheon’s Chinatown again during my recent trip to Korea (partly because I really wanted to eat some great jjajangmyeon again), but instead of heading to Cheonghwawon (中華范) , we decided to try another restaurant. There are a few really famous ones in Chinatown with superrrr long queues because of its reputation and long heritage, but we honestly were not keen on queueing in the chilly air. This one we found is actually quite popular as well, and we were quite attracted to the fact that they filmed one Running Man episode here, so we wanted to go in and try this out for ourselves. Plus point: This was the filming location for Running Man! All the staff we encountered that day speak fluent Chinese and Korean. If you need to communicate with them but can’t really do so in Korean, it’s definitely helpful that you can speak to them in Chinese and they’ll understand. I think they do know smatterings of English, so it should not be a big problem even if you do not speak Chinese. So I found out for the first time that jjajangmyeon is actually also available in a white version! Apparently you can only find this version in Incheon (?) so you won’t see it in any other part of Korea. I’m actually not too sure what the difference is, I’m guessing it’s a difference in the type of bean used? 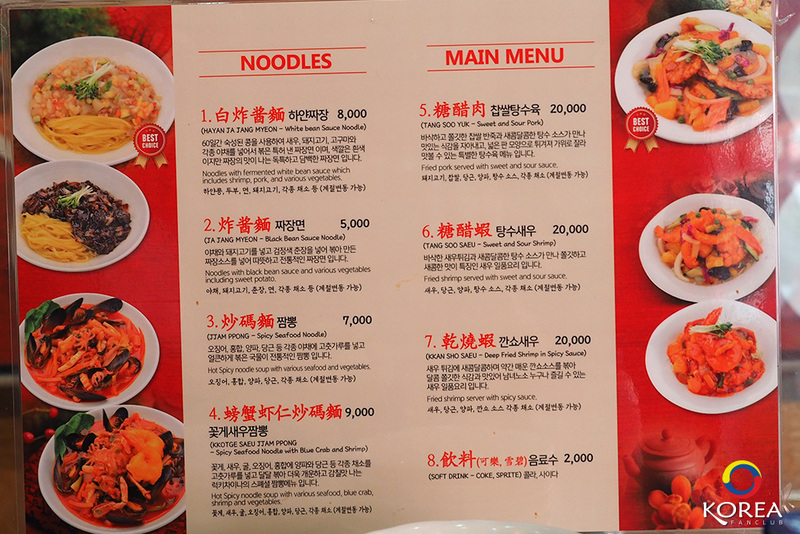 Personally I thought the quail egg in my original jjajangmyeon was quite a cute touch. I’ve eaten my fair share of bowls of jjajangmyeon, but never seen any other restaurant do this. The original jjajangmyeon is really good – the sauce tasted rich, ingredients such as sweet potato and onion were generously given, and the noodles springy enough to my liking. I also appreciate that they give pretty big portions for 5000 won – I do find it a little difficult to finish, but it’s great for anyone who has a good appetite. The tang soo yuk was okay – not super good, and I personally think the 20 000 won price tag is really hefty. I think it’s similar to something else that we eat in Singapore (with a few tweaks to the sauce and flour/batter used), and it definitely costs less here. If I’m not mistaken, this is an expensive dish in Korea so I guess it’s understandable in that context, but if you are not keen on spending your money on it, it’s fine. We came out of the restaurant happy that our bellies were filled with warm goodness on a cold winter day. 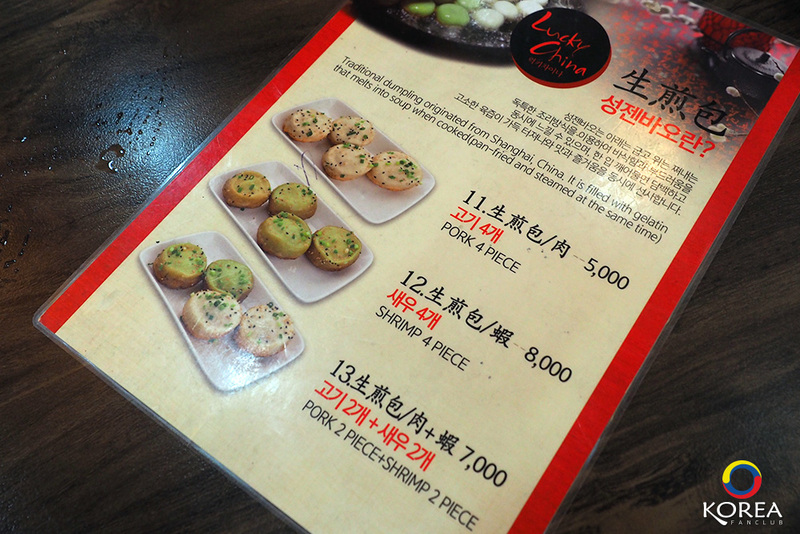 If you don’t order something too expensive (aka tang soo yuk), this is a restaurant that can fit a decent budget. Other than that, I was satisfied with Lucky China, from the delicious food to the good customer service, and definitely recommend that you check it out when you’re in Chinatown. When you first enter Chinatown from the entrance opposite Incheon station, keep to the right and walk up the slope. When you reach the junction, turn right and walk straight for a short distance. Lucky China will be on your left. You can also use Naver Maps (which I recommended here) to find directions with the address above, or ask any local in the area.